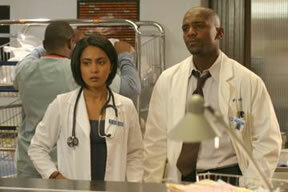 The sugary romance between the excessively noble characters played by Parminder Nagra and Shafiq Atkins on ER follows the much hotter one between Ming Na Wen and Mekhi Phifer that ended two seasons ago. GreyÂ’s Anatomy features Sandra Oh in an up-and-down relationship with Isaiah Washington. What accounts for such interest? ItÂ’s as though these couples have been pouring out of medical schools and producers decided to capture the trend. Class dynamics may be important in the appeal of Asians to some African Americans. And the “bad boy” image (stereotype) may make people of African descent more attractive to children of immigrants traditionally considered too studious and repressed (spelling bee/ math team champions) to be generally attractive. Or maybe not: since there are no hard statistics, this could be just another Dubious Trend Story in line with infamous New York Times stories about baby gyms in Manhattan, or Ivy League women who decide to drop out of the rat race to become trophy wives. The next time you see an East or South Asian woman dating a black man … it may simply be that they are two people who happened to meet, and fall in love — irrespective of Parminder Nagra, and sociology be damned. This entry was posted in Issues, TV by amardeep. Bookmark the permalink. This is something you said earlier that I wanted to address, but, oh gosh, got caught up in the whirlwind of this thread, which we should call a rope by now. I echo your sentiment, because the nomenclature doesn’t sit well with me either. I just think identifying oneself by one’s skin colour (something South Asians here in the UK don’t do, by the way) is a very, very bad idea. In my view, as I mentioned earlier, it’s a “step backwards”, and I also have reservations about the notion of desis using something as superficial as their skin colour as their primary form of self-identification, even if the term is just casual slang. To me it isn’t about identifying myself by the color of my skin but attached to the sense of pride in being a different shade. I work in the Cosmetics industry, one that caters to white women and black woman and of late some hispanic shades but leaves out catering to Asian women (yellow base) and South Asian women (olive base) and being brown is something I have to reiterate over and over when we do new product launches. Not to use as a slang but to point out that it’s a different group of people, with different identities and different looks that should be taken into account and not disregarded. To me it’s more a matter of pride than anything else and I see that with the usage of the word everywhere. Aditi, With all due respect, we are all adults here perfectly capable of understanding the difference between open and crass as you seem to imply. If we start applying prudish and overly sensitive filters to what we comment on the threads would die at 5 comments. That is what makes this place a mutiny, exciting and sometimes nutty. People say it like it is and keep it real. OK last post I swearÂ…I swear no more. Kill it kill it kill it kill it kill it ALREADYYYYYYYYYYY!!!!! !